"Use The Simplest, Fastest And Smartest Way To Have People Market Your Products For You Without Paying them One Bit!" In this modern world of mass advertising and constant hard sell, I'm not surprised many consumers feel jaded. They've been smacked left, right and center by advertisers and marketers who desperately try to shove their products down their throats. And many consumers have over the years turned a blind eye and a deaf ear to all the marketing and advertising messages that swirl around them. Fortunately for the marketer, one effective way of getting the message across has been around for centuries â€“ and that is marketing by trust, or in modern terms, viral marketing. In the past, people who wanted to eat something delicious or wanted to purchase a solid, quality piece of equipment would have gone to visit a particular business based on the recommendations of friends, family, or others in general. And guess what â€“ this form of spreading a message virally still applies in today's context! The truth of the matter is, many people out there are jaded, frustrated and unhappy with the conventional ways of being marketed to and this is where your huge advantage comes in. Imagine having a product that heaps of people will be more than happy to tell their friends about, who will spread the message to their friends and then spread the message further on. It's like having a team of non committed sales men who spread the gospel of your product without paying their salary, medical benefits or spending on any other kind of expense! Of course, you'll have to create a product that is free and interesting enough to get passed around for every one to continue forwarding it until the entire world knows about it...but how do you create such a product? You must be wondering if heaps of cash need to be spent or you'll need to hire freelancers of any sort...well, the truth is most probably not! I've used the viral method in my marketing endeavors and over the period of 2 years, realised that there were so many simple, free and effective methods to create a viral product which flies around the Internet more times than a budget airline! After using these methods to product heaps of traffic and sales for a while, I decided to 'play it forward' and let you get your hands on these powerful yet simple methods which run like clockwork. The most important human element that makes viral marketing actually work like crazy! How to make sure that people get access to the product without complications...if not you're going to have a lot of problems! Targeting viral 'carriers' and why they could mean the difference between an explosive viral campaign and a one that crashes and burns. The one place you should utilize to launch your products and stupid mistakes you shouldn't make while using it! One seasoned marketer had coffee with me the other day and I showed him the viral marketing secrets guide, and asked for his opinion. "Not bad, you could charge those newbies $67 over for this and they'll still buy it. ", he added with a sneaky smile. Guess what? I'm throwing his advice out of the window. It's simple. Most people who need advice and tips on marketing usually are at their wits end. It's just not right for me to charge so much when they're already broke. Secondly, I believe in building trust. I am confident that if I over deliver, you (or most of my customers) will come back because of trust. Lets be honest in this area shall we? For the price of a dinner for two at Denny's, you'll get a probable return of massive hordes of hungry prospects and loads of consistent profits. Imagine having loads of time to go on a vacation knowing that your web pages and your business is virally being spread around the net without you having to lift a finger. 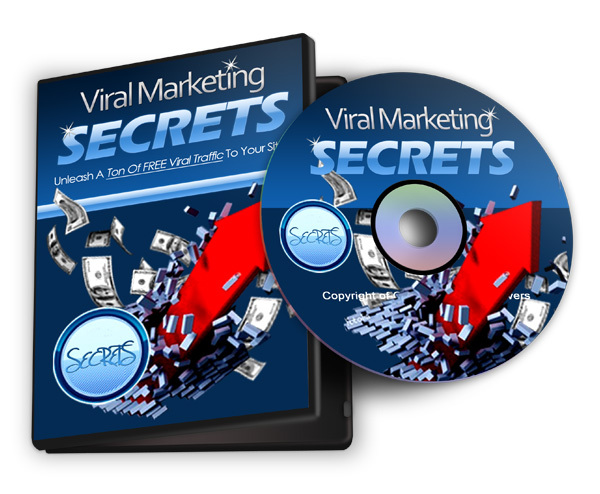 Get Viral Marketing Secrets now!